Johnathan Tannenwald explores the Union’s must-get players for the offseason. FourFourTwo lists Keegan Rosenberry as potential trade bait. Andre Blake came in second for Goalkeeper of the Year. Looking ahead to the expansion draft. If you haven’t signed the #SaveTheCrew letter, you should. This move threatens the very essence of MLS. Meanwhile, Columbus fans will be turning out in force for Tuesday’s playoff game vs. Toronto. Currently tickets are standing room only, and who knows how long they’ll last. As the Timbers search for a new coach, the Union are used as an example of how Portland isn’t quite so cheap. More on Caleb Porter’s surprise departure from Portland. And more. And even more. Dallas’ Tesho Akindele is the first player to receive a degree through MLS’ partnership with Southern New Hampshire University. Vancouver is ceasing operation of Whitecaps FC 2, and instead affiliating themselves with USL expansion side Fresno FC for future player development. David Beckham still hasn’t got a stadium in Miami, but he’s already shopping for a manager. Tim Whea could find first-team minutes in Paris. Shaq Moore started for Levante UD over the weekend, the first American to do so. Eight women have received their first USWNT cap since mid-October. Arsenal’s Xhaka had an interesting story even before he got to London (or Mönchengladbach for that matter). Sampdoria good, or Juventus bad? This is an important discussion. Sadly, it looks as though MLS and the Crew owner have had plans to relocate to Austin from the minute the new Crew owner purchased the team. The Crew ranked 20th in attendance this season. This move by Precourt is evil but the fact is their attendance numbers have not been great. I want Crew to exist in Columbus, but where were the sellouts during the season? The Union averaged more fans per game and were a worse team. I could understand if they were last but they are in the playoffs. It seems like it’s too little too late. I won’t leave MLS blameless in this, but when one looks at Cincy’s numbers in a college football stadium compared to Crew’s 15,000, from a business perspective that’s quite an appealing situation. People in the know say Columbus did nothing to market the team since the rebrand. Don’t know if that’s true or not, but certainly fits the fact of the matter, which is that Precourt planned this move since day one. Crew fans also claiming that the league stuck them with a large amount of games in March and April and scheduled all the high drawing visiting teams midweek. Yea he had language written in his purchase agreement allowing him to move the team, and the story is that they haven’t marketed or made improvements to basically force the city to lose interest. So regardless of the way you feel about that, it seems to be working. The presentation that the Save the Crew group did about the moves that Precourt and MLS made to shape this narrative was pretty damning. Totally ‘Major League’d the Crew!! The Cincy / Crew rivalry would be real though (unlike the ‘Trillium Cup’) so MLS is shooting themselves in the foot. Part of the 2k drop in attendance for the Crew this year might be associated to FC Cincy, but I don’t think there is that much overlap (100mi apart). …and as possibly the only Werder Bremen fan in Philadelphia. WOOOOOOOOOOOOOOOOOOOOOOOOOOOOOOOOOOOOOOOO lets stave off relegation once again! I’m not IN Philly anymore but WOOOOOO!!! It’s amazing what a difference a healthy Kruse can make. Too bad Union aren’t in the market for a manger. Preki out at St Louis. Nesta out at Miami…. Tony Pulis! Rosenberry on the market? Do we have any depth there after Ray Gaddis? Warren Creavale? Yikes. I’d love to nab Nguyen from New England. Not the big splash #10 I think we’re all looking for. But if he’s on the block, there’s no way he can’t be a help. I realize it was speculation. Just thinking about it. What is going on with Zardes anyway? How on earth did he end up playing as a fullback? If Rosenberry were smart he would run as far away from Curtin as possible (same with Elliot). Given the depth at Creavale’s position I would leave him unprotected and protect McCarthy instead, given that we know Blake will likely miss time somewhere along the way with the Jamaican national team. Odds are no one is taking either. But competent, cheap backups are readily available for both positions so it is a toss up. They’re not “Philadelphia Union cheap”. Wow. Nice. So…it occurs to me that we are basically the Cleveland Browns of the MLS. That franchise was long known for having problems because they were so cheap…and then, even when they started to spend a little, they found themselves unable to make a decent decision. Every move they made was wrong, wrong, wrong. Feels to me like that is the path the Union are on. Jim, thanks for bringing so much attention to the #SaveTheCrew letter while too many supporters groups (including our own) have stayed silent. Regardless of what anyone thinks of Columbus or Austin, if the game is going to grow in this country we need high quality academies in every major population center. Destroying an academy just to build a new one thousands of miles away is a step backward for the sport and MLS. We certainly have had individuals stepping up, but I’d like to see a united statement from SOB on the matter. It doesn’t have to even mention Columbus or Austin. Hey guys, that was me up there in 135 with the banner. I will gladly donate it to SOB if you will put it up during the season. ATL supporters put a Save the Crew banner up for their playoff game against each other. Many other MLS supporters groups (including the Sons of Ben) have done a lot to support the Save the Crew movement. What have you done, Kevin? I’ve written letters to the Union FO telling them I won’t be purchasing tickets in the future if the Crew are relocated. I’ve canceled my MLS Live account and written to the league telling them why. The Screaming Eagles endorse #SaveTheCrew on twitter and in their newsletter and encourage their members to help. I don’t understand why we’re not doing the same with Sons of Ben. If you’re acting neutral, you’re siding with MLS. Well, I hope all of that works. I’ve signed the petition and sent an email to MLS HQ, but I think that we all know how MLS operates when they want something to happen. Writing to MLS feels a lot like writing to one of my senators about healthcare repeal or tax reform. One of the things that everyone needs to do is contact ownership groups. Right now a rejection by the owners when they meet to ratify the move is most likely the only way to stop this. We need to shame Garber into doing the right thing, and we need the owners’ help. Prove to them that this affects everyone, not just Crew fans. In the mean time, cancelling MLS Live now (even if you re-up in Feb) and making it as public as possible will help send a message. Uninstalling MLS App helps too. Again, make it as public as possible. Include Sugarman on your messages if you can. It’s something I feel very strongly about and really can’t abide the crushing silence on what’s going on in Columbus. The neutral position is that if MLS allows this move they are killing the strongest argument for supporting the league over a foreign one. There’s no excuse for ANYONE to keep quiet about it. Agreed. If MLS thinks we are paying what we pay for tickets solely for the honor of watching the likes of Hoppenot and Fabinho they have another thing coming. As you’ve said, MLS’ business model relies very heavily on ties to local communities and growing the game of soccer in the US. Can anybody summarize Tannenwald’s article, since philly.com is now behind a paywall? Did he speculate on players or just positions? 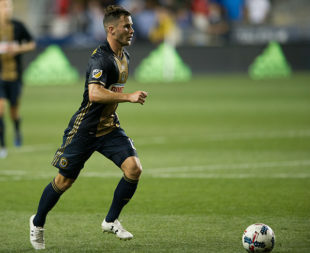 Sporting director Earnie Stewart said in a recent interview with the Inquirer and Daily News that his shopping list is ready, and that it’s aimed toward “the offensive part” of the field. “We would like to add something extra,” he said, noting that his standard of measurement is former Union playmaker Tranquillo Barnetta. Who specifically will do the looking? Stewart for sure, given his many connections in Europe. Technical director Chris Albright leads scouting of the Americas. The staff also includes Kyle McCarthy and Terrence McFadden. There is one thing Stewart doesn’t know: just how big the aforementioned increase in targeted allocation money will be. Nor do many other people across the league, including executives at other clubs. You can add Stewart to the list of the frustrated. Curtin said the shopping list also includes a winger. With Chris Pontius’ departure, there is room on the roster and the salary cap for a substantial signing at the position. But the team is not looking to upgrade at striker right now. In the wake of C.J. Sapong’s team record-setting 16-goal season — and his strong performance in the U.S. national team’s 1-1 tie at Portugal on Tuesday — Curtin and Stewart are keeping Sapong atop the depth chart.